This post is a long time coming but I had so many treats to share with you that not only has this post been delayed but is even split into two parts and hopefully you can see why. The second week in June in probably one of my favourite weeks, nope it doesn’t contain my birthday and sure isn’t Christmas. 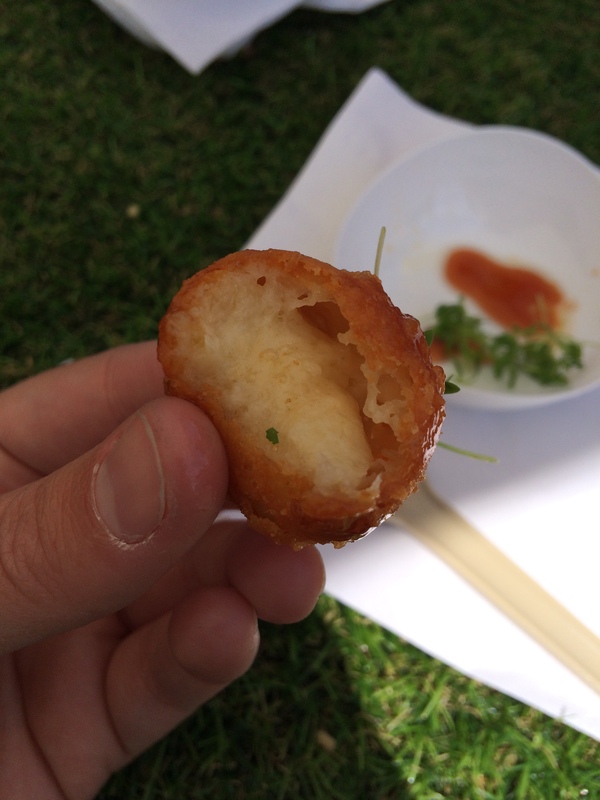 But it’s the week where Regents Park in London gets a foodie makeover to host the wonder that is Taste of London 2015. The past couple of years (which you can read about here and here) me and my cousin, Katherine have embarked on a foodie exploration together one tapas portion of heaven at a time. There may have been a spreadsheet with the menus imputed and cross-referenced, highlighted to an inch of its life to make sure nothing was missed out. This year we allowed Katherine’s husband Dan the pleasure to join us, but I have my suspicions that it was so that we could order more food without looking as greedy as we actually were. We tend to treat ourselves to the VIP tickets when the early bird discounted tickets go on sale as work for us to include Crowns (the currency of the festival 1 Crown=£1), the festival recipe book and a glass of champagne in the VIP tent where you can rest your weary legs. Also, you get to head in just before the main body of people who when you have a list of 16 dishes to try in the 4-hour lunch slot, every minute count! Barbecoa was our first stop with the sinful dish of – Slow Roasted Pit Beef with New York Slaw, Ketchup, Beef Dripping Crumble. Yes, it was definitely as good as it sounds. 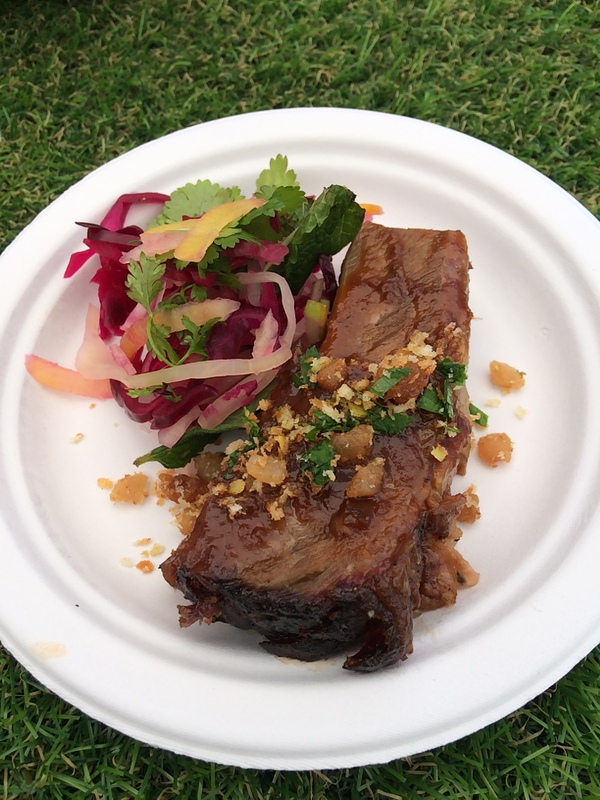 The fresh crunch from the slaw with the sticky fatty beautifully tender charred beef – wow. And those beef dripping crumble nuggets – Forget about it! (In my best fake New York accent!) Strong start. Fortunately, Shake Shack was right next door and on our list of dishes to try. Putting it out there, I’m not the biggest fan of their burgers but their Frozen Custards I have made journeys cross London to get my mitts on one of these chilly delights. 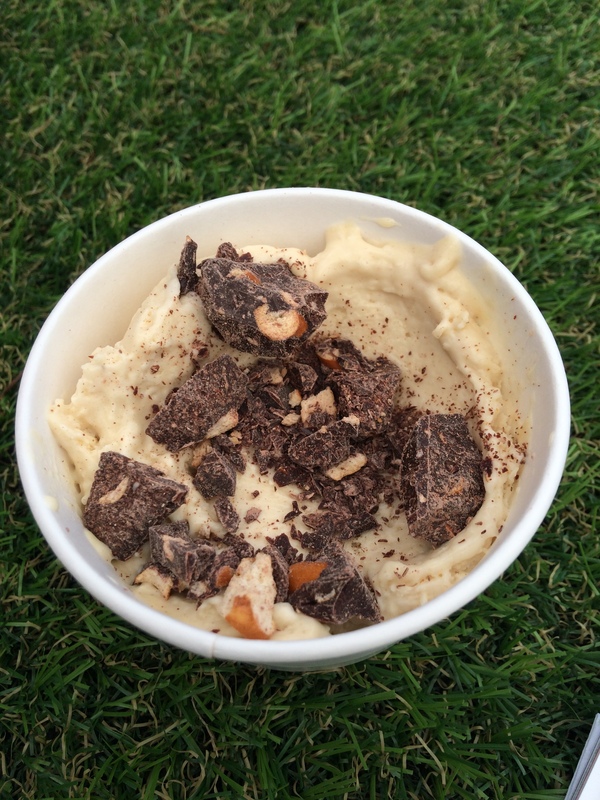 Malted Marshmallow Peanut Butter Frozen Custard topped with Crumbled Chocolate Covered Pretzels. Basically anything with peanut butter then you have mine and my cousins hearts. There seemed to be fewer desserts on the menus this year so happy to tuck into this beaut. We just ran out of time to get a second one on the way to the exit. Again we had planned our route with accuracy and Amestsa with Arzak Instruction was next up. 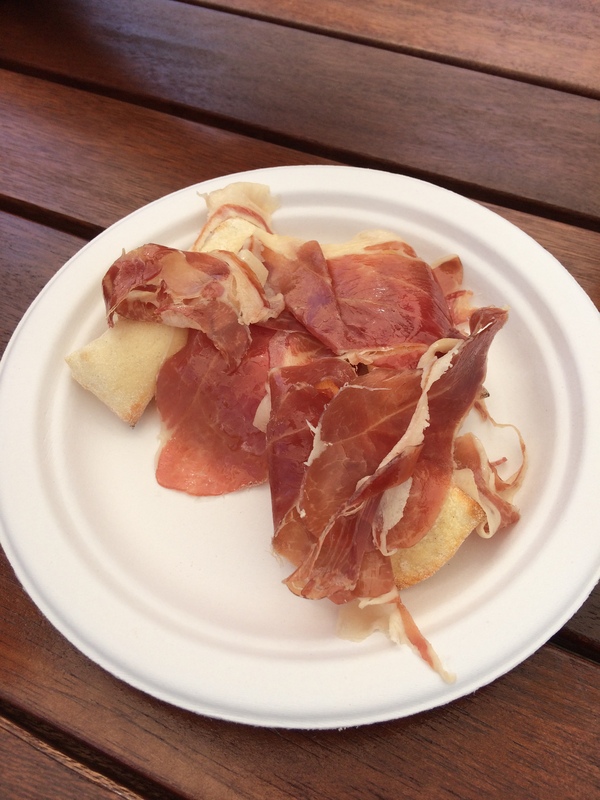 The Jambon Iberico sobre Almohada de Pan – Iberico Ham on a Bread Pillow was one of our favourite dishes we tried last year and pleased we got a chance to share it with Dan. Clean, simple and allows the natural flavours of quality ingredients sing through. Dishes don’t need to be over complicated. 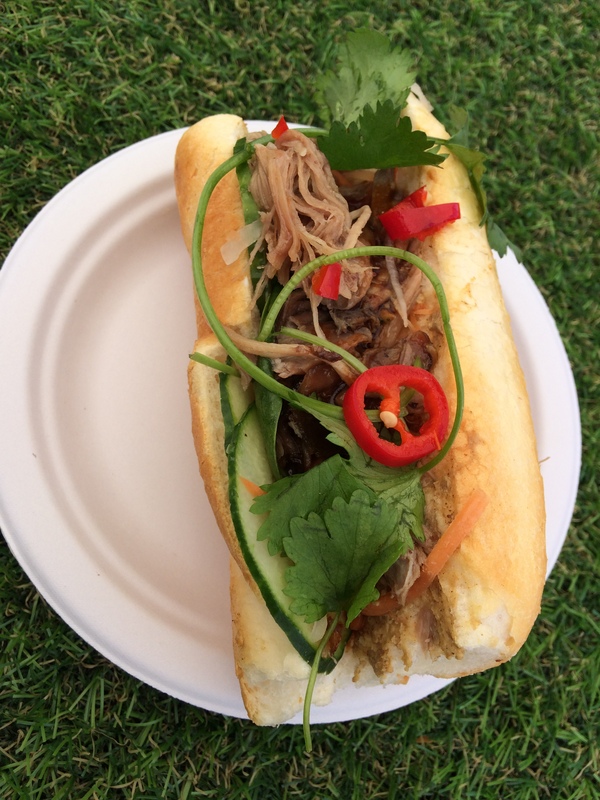 On the theme of fresh clean flavours is The House of Ho – Smoked Duck Banho Mi Sandwich. Melting tender shredded duck with fiery chilli and a coriander hit all in a chewy french baguette. This was one of Dan’s favourite dishes of the day. It was up there for me too. 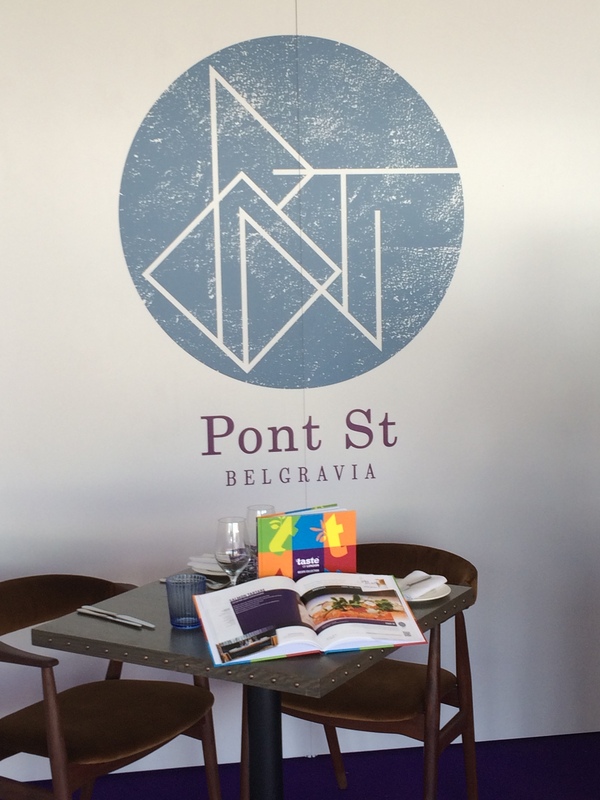 Now the next dish from Pont St was one of my favourites of the whole festival and when you hear what was being served up I’m sure you can understand. 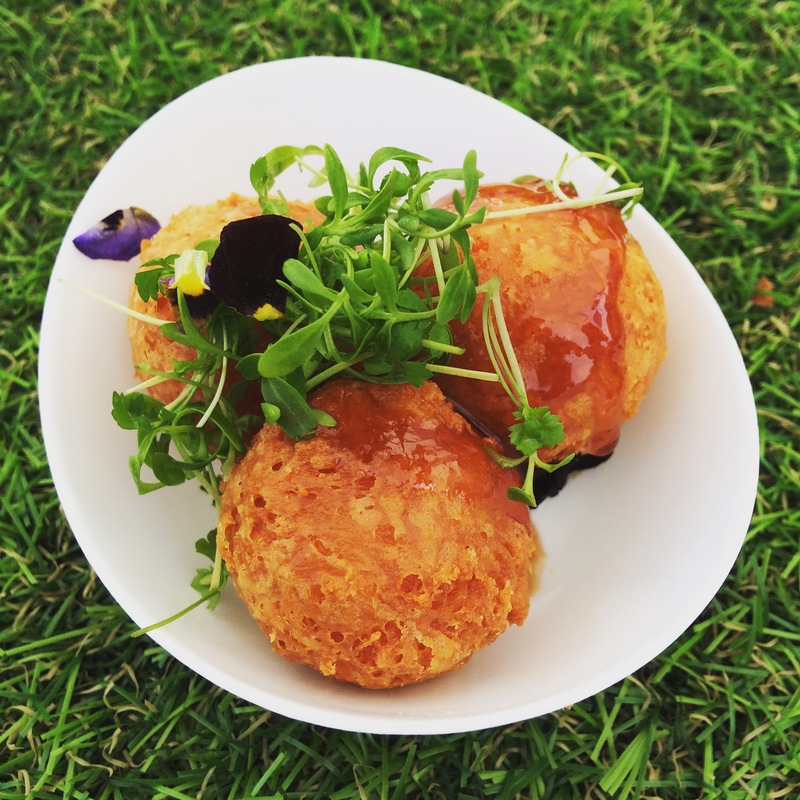 Hot Cheese Balls with Pont St Quince Jelly. Yep that’s right. Hot Cheese Balls. Hot. Cheese. Balls. Crunchy, oozy, cheesy with the sweet tartness from the quince. Amaze- cheese- balls. We totally went back for seconds. Time to switch it up to an iconic dish that has been on my ‘Must Eat List’ for so long and the green eyed monster always comes out to play when I see the dish on someone’s Instagram. 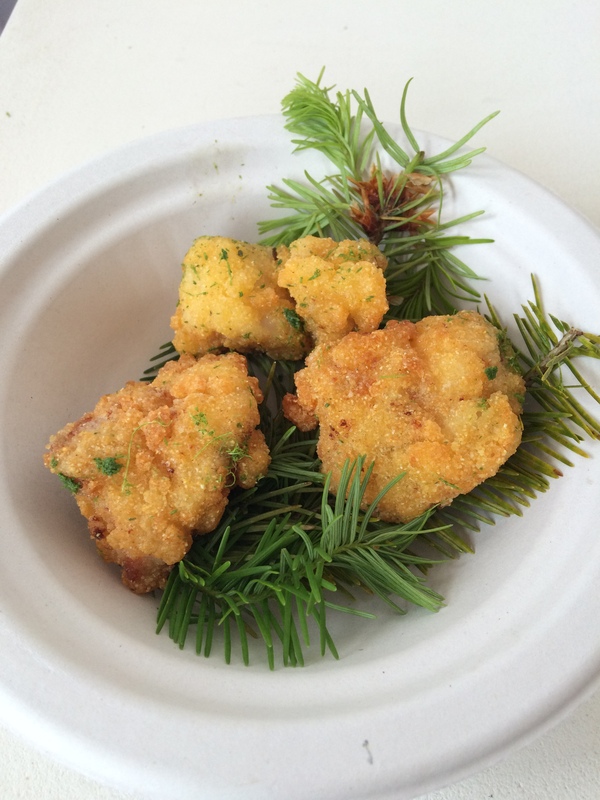 It has to be the one and only – The Clove Club – Buttermilk Fried Chicken & Pine Salt. Finally tucking in and this dish did not disappoint. Juicy to almost the point of obscenity in its uber crispy jacket with a hint of alpine air. There is always a fear when strong botanical flavours are used that it will be like gnawing on a car freshener. No fear here and an iconic dish for a very good reason. I have a thing for chicken wings. I know they tend not to be elegant or fancy, but either am I. 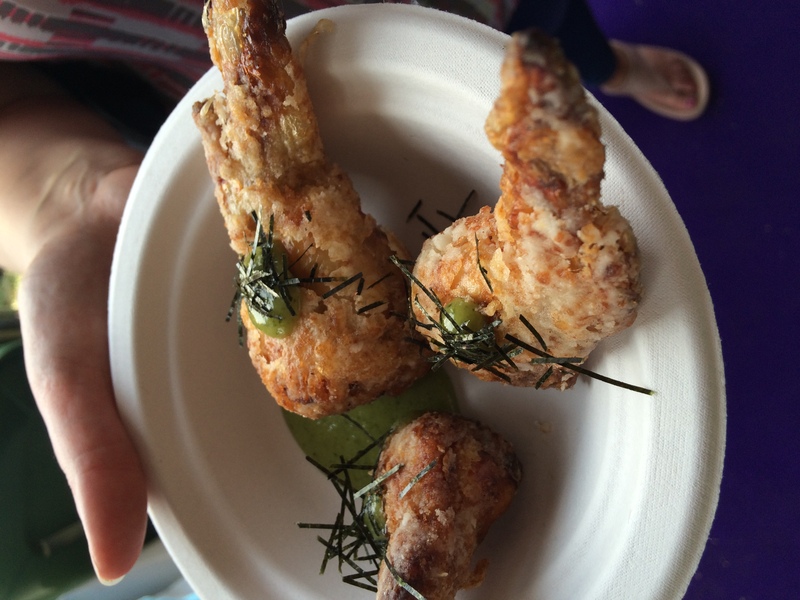 But saying that Aqua Kyoto have managed to make chicken wings elegant (if only they could do that to me!) Karaage of Stuffed Chicken Wings, Spicy Ginger Lime Mitsuba Miso sauce were the things my chicken wing dreams are made of. Boned wings stuffed full of flavour on flavour and then another hit of flavour in these crispy juicy pterodactyl sized chicken wings. I’m ashamed to used the wing tip bones to soak up every last drop of the miso. 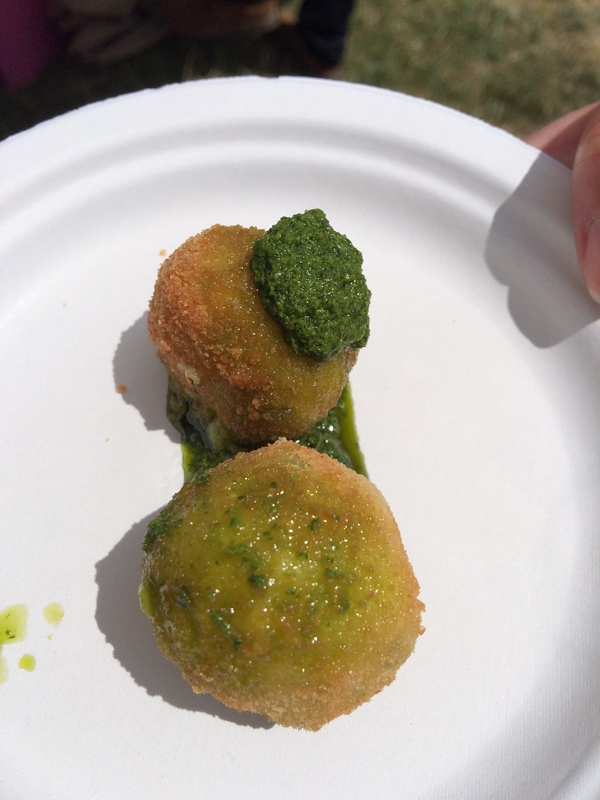 Stay tuned for the second half of Taste of London, so many, many more dishes to come!